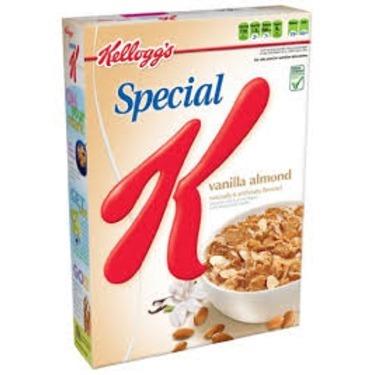 Special K® Vanilla Almond Cereal can make you look good all over too. With just 1.5 grams of fat per serving, it’s an oh-so-happy way to start your day. 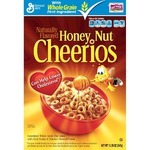 Crunchy rice and whole grain wheat flakes are sprinkled with roasted almonds and a touch of honey and vanilla. Just pour yourself a serving any time you need a little "home sweet home." We've got you covered. Une gâterie pas pêchée du tout. Excellentes céréales pour déjeuner ou pour un petit creux de fin de soirée. On ne se sent pas mal du tout et c'est si bon. Un goût somptueux de vanille et le mélanger avec les amandes croquantes est réussi. Nice start to a morning with this cereal. Is is very crispy and has a naturally sweet flavour with the vanilla. I enjoy the almond pieces as well as it adds a great texture. Goes well with milk and does not get overly soggy fast. It is reasonably priced as well and easy to find at the store. Pretty much eat this one every day. Nice vanilla taste and when I get bored I throw in a handful of blueberries or strawberries. Try it you will love it I promise. My husband loves it. 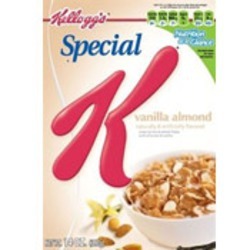 He used to eat this in his breakfast daily and never get bored which is good for me😉 because I don’t need to make any food for him.. Kellogg’s are super healthy and delicious cereal. This is my morning staple (and a great snack! 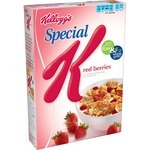 ), I love the taste of this cereal. The price is a little high but that comes with any cereal where I live. 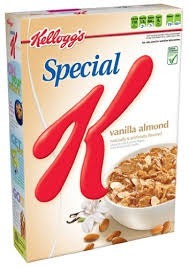 Highly recommend this cereal. 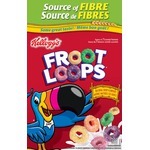 TThis is my favourite cereal to eat in the morning. Super healthy for you to begin with that is a huge bonus. Also it tastes great and also keeps you full! I bought this product when it was on sale as I was curious. It is very satisfying and tasty with a perfect hint of sweet. It has becaome not only a great breakfast, but evening sweet craving snack that's healthy too! Kellogg's Special K Vanilla Almond Cereal is my breakfast go to. It's sweet, but not too sweet; and healthy, but it doesn't taste "healthy". I especially love the almond flakes. Pour almond milk on top, and you've got a delicious breakfast to start the day with. Mm! 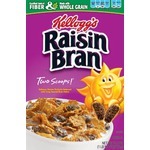 This cereal is sooo good! It’s sweet enough that you do not need to add sugar. It also has tiny bits of almonds in it which I love. It’s crunchy and I can’t get enough.